This time of year we see a fair number of calves with broken legs. Typically the calf is a few days old and gets stepped on by over eager, protective moms. The good news is, these breaks can heal with a little TLC, especially in young calves with fractures of the lower leg. 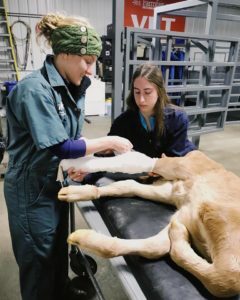 A broken leg calf, with appropriate care, casting, and monitoring generally has a good prognosis. Although it can depend on the location, a cast is applied, left on for 4 weeks and a positive outcome expected! 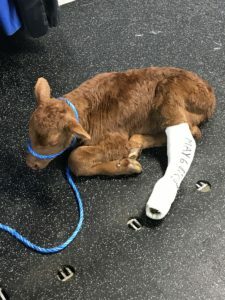 If you have further questions on casting calves with broken legs, please give the clinic a call. This little guy was only a day old when he fractured his back lower leg. Thanks Dr.Lewis and RVT Cassandra for getting him on the road to recovery!